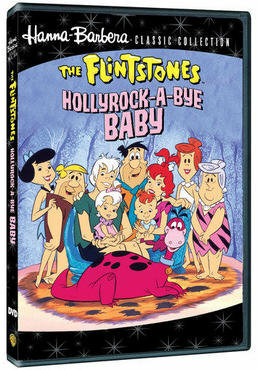 Just announced today by the Warner Archive program (Warner Bros.’ online sales of less-popular or more obscure movies and TV shows burned to DVD-Rs) is the release of the Flintstones’ various primetime specials and several TV movies to DVD for the first time. This includes the various late 70s/early 80s primetime specials that aired on NBC, meant to bring the modern Stone Age family back into the limelight (outside of Saturday mornings and syndicated reruns). While most of these were released years ago to VHS, they haven’t appeared on DVD until now. “The Flintstones Meet Rockula and Frankenstone“: I wrote about this one for last year’s series of Halloween special posts. A late 70s one-hour special where the Flintstones and Rubbles travel to prehistoric “Rocksylvania” and meet Count Rockula and the Frankenstone Monster. “Little Big League”: A baseball themed special where a preteen aged Pebbles is shown to be an excellent baseball player (ignoring “The Pebbles and Bamm-Bamm Show” episode portraying her as knowing nothing about the game), whose team ends up playing against Bamm-Bamm’s, who, given his super-strength, is also an excellent player. “Fred’s Final Fling”: The old “a character believes he has a short time to live” sitcom plot (done once before on the original series itself). Here, thanks to an erroneous x-ray at the doctor’s, Fred thinks he has 24 hours left to live. “Wind-Up Wilma”: Wilma’s excellent pitching skills (which knocks out a pair of robbers) earns her a spot as the pitcher for the cellar-dwelling Bedrock Dodgers baseball team. Bedrock is shown as having moved into the (prehistoric) 70s and 80s, with Fred and Barney noting more and more cavewomen are working outside of the home (despite Fred still being a jerk about such). The 1993 TV movie that sees the adult versions of Pebbles and Bamm-Bamm finally getting married. One bizarre retcon of how Fred and Wilma get married mars this one. This film in a flashback shows Fred and Wilma having eloped to Rock Vegas to get married, which feels awfully similar to how Homer and Marge got married on “The Simpsons” (the 1991 episode “I Married Marge” showed Homer and Marge marrying at a clearly-Nevada-style wedding chapel). The original series, however, showed Fred and Wilma having gotten married at a mountain resort. There’s also the oddity of most of the wedding guests being friends or relatives of Fred, Barney, Betty, and Wilma, and not Pebbles and Bamm-Bamm’s friends (save two coworkers of Pebbles’ that look/act like Penny and Wiggy from “The Pebbles and Bamm-Bamm Show,” but aren’t Penny and Wiggy…). In this TV movie, Wilma and Betty are shown starting their own catering business. The catering job might be a reference to the comic strip “Blondie” having then-recently given Blondie such a job (over Dagwood’s initial objections). These aren’t Wilma and Betty’s first permanent jobs, however: they were formerly reporters for the “Daily Granite” newspaper in the 80s “Flintstone Comedy Show” Captain Caveman segments. The 1993 sequel to the above, this TV movie shows the newlywed couple (Pebbles and Bamm-Bamm) moving to Hollyrock, where they expect the birth of their child—or children, as it turns out to be twins: super-strong white-haired daughter Roxy, and red-haired son Chip. The elder Flintstones and Rubbles show up before the blessed event, with the usual Flintstone hijinks ensuing. I liked this one more than the first film. The puns were also flying a bit more here, given the Hollyrock setting: there’s apparently a Janet and Michael Jackstone; Hollyrock sights include the “Clay Museum” and “Granite’s Chinese Theater“; plus we see animation studio “Hanna-Barberian Productions” (the home of “Yogi the Cave Bear”; Yogi Bear’s prehistoric self’s TV show was mentioned on the original series). I imagine all of the above will see a release eventually through the WB Archive program. Minorities in cartoons: "Sanjay and Craig"